What's the best way to solve problems between people? By talking them over and working them out. It's never too soon for children to learn the process of peaceful conflict resolution. This book distills it into clear, simple language and supporting illustrations. Children learn to calm themselves, state the problem, listen, think of solutions, try one, evaluate results, and even agree to disagree when a solution isn't possible. Includes conflict resolution skillbuilding games and role plays for adults to use with children. Now children and adults can enjoy our most popular Learning to Get Along® books in English and Spanish. The Free Spirit Learning to Get Along series helps children learn, understand, and practice basic social and emotional skills. Real-life situations, lots of diversity, and concrete examples make these read-aloud books appropriate for all homes, childcare settings, and primary classrooms as well as special education, including settings with children on the autism spectrum. 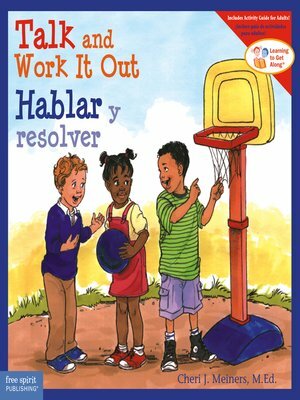 Presented in a social story format, each of the bilingual Learning to Get Along books includes a special section for adults in both English and Spanish, with discussion questions, games, activities, and tips that reinforce improving social skills.